Larnaca, or Larnaka, is a city on the southeast coast of Cyprus. The major international airport of Cyprus is located in this city. In ancient times, Larnaka was known as Kition, or (in Latin) Citium. The biblical name Kittim, though derived from Citium, was in fact used quite generally for Cyprus as a whole, and occasionally by the Hebrews for the Greeks and Romans. 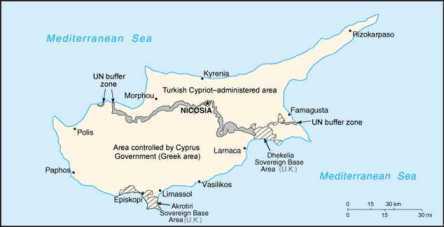 Originally the principal Phoenician colony in Cyprus, it later became a part of the Hellenistic world. The ancient site is at the north end of modern Larnaca. The earliest remains go back to the Mycenean age (ca 1400-1100 BC) and seem to mark an Aegean colony, but in historic times Citium was the chief center of Phoenician influence in Cyprus. A Phoenician dedication to Baal, dated also to the 7th century BC, suggests that Citium may have belonged to Tyre. The discovery here of an official monument of Sargon II suggests that Citium was the administrative center of Cyprus during the Assyrian protectorate (709 - 668 BC). During the Ionian Greek revolts of the 4th century BC Citium led the side that was loyal to Persia and was besieged by an Athenian force in 449 BC. The famous stoic philosopher Zeno of Citium hailed from the city. It is said he began his stoic teaching aftter losing everything he had in a shipwreck. A famous Athenian general, Kimon died at sea defending the city of Citium in a major battle with the Persians of Xerxes. He told his officers to keep the news of his death secret. The quote "Even in death I was victorious" was attributed to Kimon. A statue of 'Kimon the Athenian' stands proudly on the sea front promenade of modern Larnaca. Like other cities of Cyprus, it has suffered repeatedly from earthquakes, and in medieval times when its harbour silted up (a sign that the island was deforested and overgrazed) the population moved to Larnaca, on the open seafront farther south. The harbour and citadel have now disappeared. Traces remain of the circuit wall, and of a sanctuary with copious terra-cotta offerings; the large cemetery has yielded constant loot to illicit excavation for more than a century.